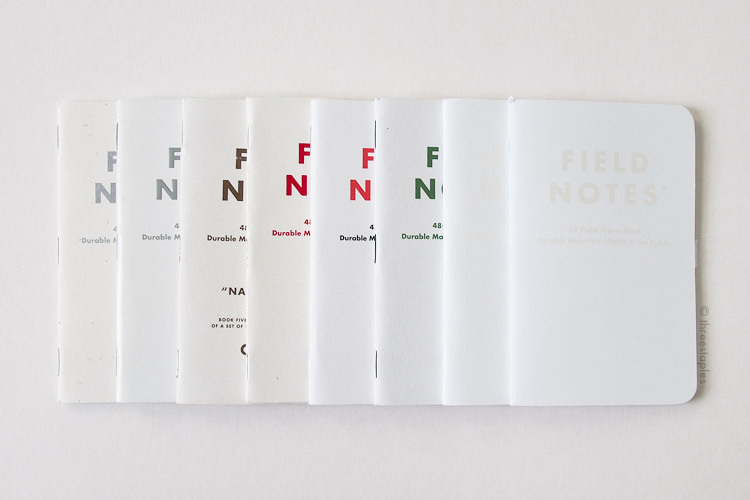 Snowblind is a winter edition of Field Notes Colors, released in November 2015. Before its release, subscribers to Colors were teased with a blinding photo of the sun, and it turned out to be a relevant hint (even though Field Notes always says the teaser image is NOT a hint). Snowblind’s key selling point is that it changes colors in direct sunlight, due to the special “photochromic” ink printed on its white cover. Color-wise, I wasn’t surprised that this edition was all white, similar to how Northerly (another winter edition, from 2011) also had the snow theme. But I didn’t expect a color-changing edition! I should’ve seen it coming, since Field Notes have mentioned in the past how they tried to work with special inks like glow-in-the-dark inks. Surprised or not, I very much looked forward to playing with Snowblind when it was first announced. Too bad my local weather wasn’t very sunny when I finally received my subscription, and I had to wait some time before I got a chance to expose my Snowblinds to direct sunlight. And boy was it fun! Watching the white covers turn blue was pretty exciting, and I even managed to make some patterns on them by masking. I used a clear, decorative gift bag with a snowflake pattern.. I used the kit from Dry Transfer to lay out “2016” on a sheet of clear film.. Unfortunately, the novelty of Snowblind wore off pretty quickly for me. Maybe it was the gloomy and rainy “winter” weather here, or maybe it’s because I was spending more time with Snowblind using it, rather than playing with it. 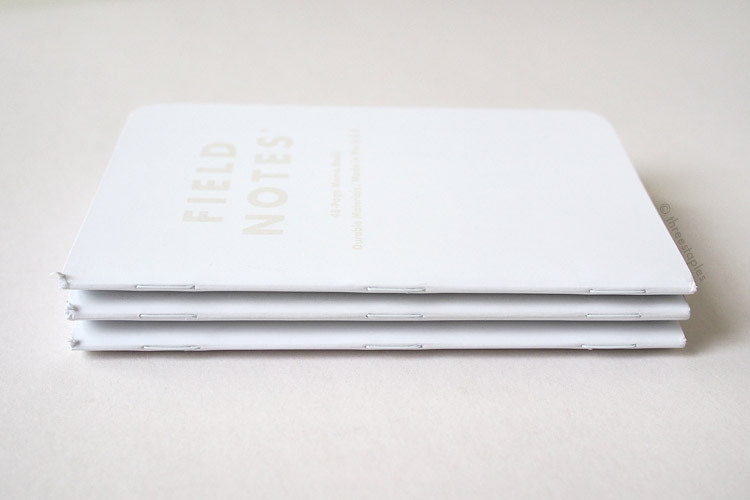 I use Field Notes indoors 99.99% of the time, which makes Snowblind simply a white-on-white notebook. A white notebook that, I might add, starts looking dingy fast. This is in comparison with other white Field Notes, like Northerly or Day Game's “Hardball White”, which both hold up well. Of course, those two editions do show some wear and tear after a while, but Snowblind doesn’t seem to age as gracefully. Perhaps, without other colors and textures to distract me, the wear on Snowblind ends up looking more amplified. I’ve tried to “lift” some dirt off Snowblind with a kneaded eraser, which usually works on other matte covers, but that actually made things worse. I guess it has something to do with the special ink printed on the cover and the odd, slightly satin texture it creates. I noticed that the blue ink used on the back cover doesn’t match the blue used on the inside cover. And did the belly band have to be yellow? I guess it did, to make the color-changing feature of Snowblind more obvious, in retail settings maybe, but the yellow in this edition doesn’t really do anything for me. Okay, now I’m just nit-picking. 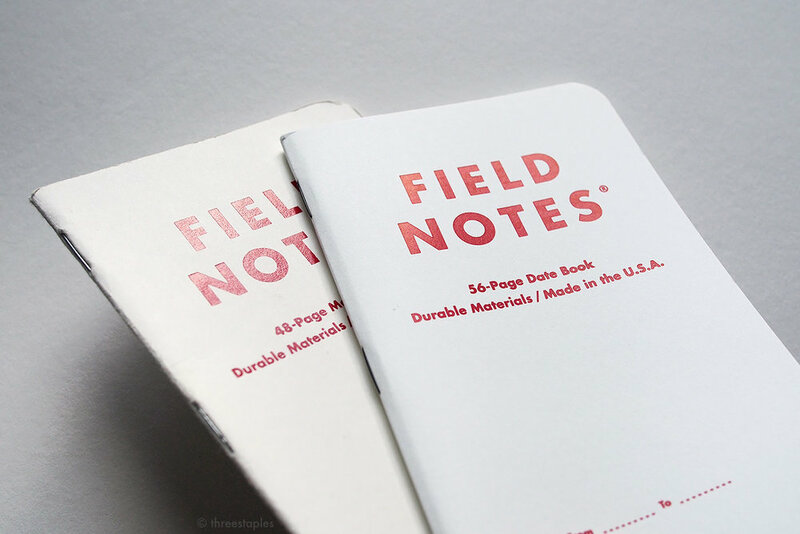 That’s what happens when I feel “meh” about an edition (see my ranking of Field Notes to see how Snowblind fares). It's hard to pinpoint what makes Snowblind one of my least favorites, but I think it's the overall texture of it, how the cover is matte but lacks the fibrous feel (too smooth?). On top of that, it gets dirty quickly, when the beauty of its look (indoors) is dependent on it being pristine all over (even its staples are white). But as a notebook, of course, it works just fine, and it fits my daily needs well. I like that Field Notes used a slightly thicker stock for the body pages again, and I enjoyed using the faint gray graph grid inside. Coupled with the light blue text on the white inside cover, Snowblind reminded me of a chilly winter landscape, even though my local weather didn’t match up. It also reminded me why I keep subscribing to Colors, and that is because I like seeing Field Notes books re-imagined in various ways, and I appreciate that they’re continuing to do trying different things every quarter. No doubt I’ll take a Snowblind out once in awhile and see its color change but as an every day memo book, it wouldn’t be my first choice. I have too many other Field Notes that I’m more drawn to. Blame it on all the special non-Colors editions lately for stealing the thunder, like the DDC Dead Prints? Apparently, this UV-sensitive pigment ink is very expensive, and Field Notes had to take “a bit of a hit in the ol’ profit-margin to get ’em into the world”. I wonder if that explains the smaller edition size of Snowblind, at just 25,000 3-packs (Shenandoah, the previous Colors edition, was 40,000 packs). The last exciting “first” I’d like to mention is the appearance of glossy white staples in Colors. 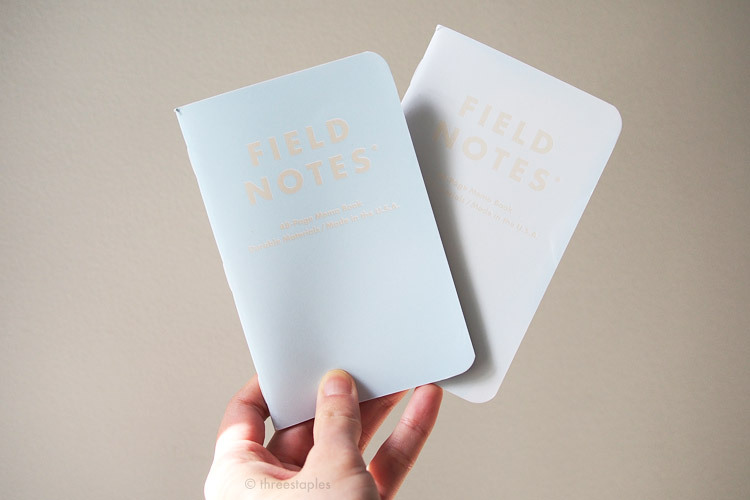 To avid Field Notes fans, Snowblind might not be the first, since the Starbucks Roastery “Coffee Origins” Edition and the Capsule A/W 2015 edition both featured white staples, but those were outside of the Colors series. For such a white edition like Snowblind, white staples is a no-brainer, and I’d love to see them again in Colors in the future. By the way, Snowblind’s cover is made with Sappi McCoy 100#C Silk and it’s not a “first” in Colors. We’ve seen the same in Unexposed (Fall 2014). As for the body paper, Snowblind is not the first Colors edition to get the slightly thicker paper (Finch Paper Opaque Smooth in 60#T). Shenandoah is. I wondered if the 60#T would become a new standard.. Maybe it’s safe to assume that the next Colors edition would get the same body paper? We’ll just have to wait and see. 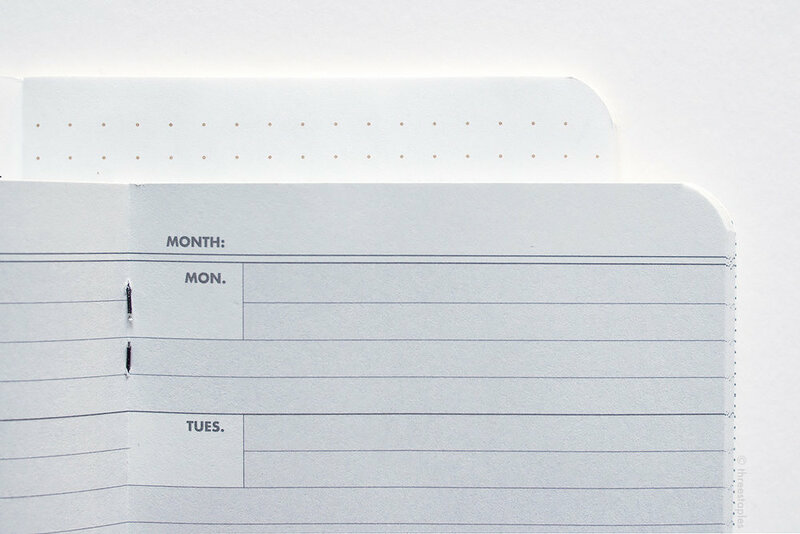 White staples of Snowblind, compared to the silver-colored staples of the Original kraft Field Notes. Another thing I wondered at the time of Shenandoah’s release: whether the mini kraft “HELLO” note in the shape of a Field Notes would be packaged with future Colors editions. And it looks like that will be the case, as Snowblind was packaged with the same promotional note. I’ve also seen it tucked in other FN products, like the 56-Week Planner, the Steno, 15-Month Work Station Calendar, etc. And this didn’t really affect my ranking, but I noticed that most of the books in my 3-packs of Snowblind have frayed edges at the corners where the cover is folded. I’ve seen this happen in other Field Notes but it seems especially bad in Snowblind. Maybe the assembly machine needs a stern talking-to. Who knows? Last note: I’m glad all the books in Snowblind are the same, which means I don’t have to buy as many 3-packs this time. The last Colors edition before Snowblind that had 3 identical books was Shelterwood (Spring 2014). That’s a gap of almost two years. Wow! Quick color comparison (left to right): J.Crew, Northerly, National Crop “Cotton”, Day Game “Hardball White”, TEDx Portland, Capsule AW 2014, Capsule AW 2015, and Snowblind. For more detailed (but slightly outdated now) “white” comparison, go here. Snowblind (right) vs. the other white winter edition, Northerly (left). Some yellow belly bands with Packet of Sunshine thrown in (upper right): Snowblind (front), Coal x DDC (left), and Loot Crate “Classified” edition (upper left). Quick graph grid comparison (from left): Northerly, Cold Horizon, Just Below Zero, Snowblind, and Original kraft. Snowblind is the 2015 Winter edition of COLORS, the 29th in the series. Edition size: 25,000 packs, November 2015. FN offered 1,000 new subscriptions starting with this edition. Covers: Sappi McCoy 100#C “Silk White” silk-screened with two custom inks: pearlescent “Interference Blue” ink and “Photochromic Blue” ink, by H&H Graphics in Vernon Hills, IL. Ink information of the blue text on the back cover is unknown, as is the lighter blue ink used on the inside cover.